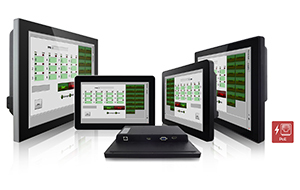 Winmate has released a new range of Touch Monitors featuring Power over Ethernet (PoE) capabilities for industrial applications. The PoE technology allows for flexible considerations of the monitor placement as electrical power is transmitted through an Ethernet Cable to the device. As a result, the displays can be placed in areas without power outlets or the need for additional electrical wiring costs as seen in displays without PoE and allows for a fast installation of the display. The PoE Touch Monitors are available in 10.1”, 10.4”, 12.1”, and 15” display sizes and come with VGA and HDMI connectors. This new series also includes projected capacitive multi-touch screen or optional protective glass and features a rugged chassis in a stylish and elegant design with IP65 for complete protection from water splashes and dust on the front side. With these features, the monitors become applicable to a large number of industrial applications such as Industrial Internet of Things (IIoT), Building Automation, Access Control and many others.